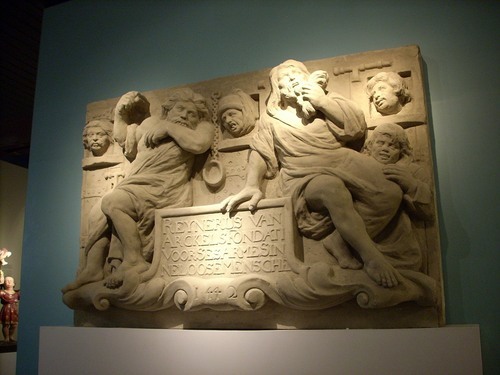 This shocking bas-relief can be seen in the Museum Dr. Guislain in Ghent. In 1442 the legacy of Reinier van Arkel made possible the opening of the first psychiatric institution in the Netherlands, a specialized hospital in 's-Hertogenbosch for the poor mentally ill. In 1686 this plaque was unveiled on the occasion of the opening of a new building for the hospital: the aim was clearly to arouse compassion for the mentally ill, so that passers-by would financially support the institution1. Photo by Luca Borghi ti.supmacinu|ihgrob.l#| (August 2009), courtesy of Museum Dr. Guislain. 1. Retrieved and adapted from Museum's label.